Please note that if you require more specific information about conditions relating to accommodation style, baggage transfer, correspondence protocol and payment requirements please contact us by email or phone. Prices quoted on our website are in New Zealand dollars. All prices specified by Trail Adventures shall be subject to change at any time by Trail Adventures due to seasonal adjustment, changes in the price of fuel or other operators altering their prices at any stage. Any price changes applicable to your booking will be promptly notified to you by Trail Adventures; the price of your tour or other travel arrangements shall not change after the deposit is made and your booking is confirmed. Upon acceptance of an itinerary from Trail Adventures whether in writing or verbally you acknowledge that you have read Trail Adventures terms and conditions and you understand and accept them in their entirety. A $250 deposit is required to confirm your booking with Trail Adventures to secure bookings for bikes, accommodation, transport and any other services that we offer. The tour remains unconfirmed until the deposit is received by Trail Adventures. By paying your deposit you take responsibility for your itinerary; you acknowledge that you have read your itinerary thoroughly and that it is as you requested i.e. dates, accommodation level, bag movements, transport, etc. Payment in full is required 30 days prior to your departure. We accept payment via internet banking and via PayPal. If payment is made via PayPal, a 3% fee will be added. Any fees relating to transferring funds to/from overseas are to be covered by the client. All prices quoted are for twin-share/double rooms. For those booking on a tour that wish to have a room to themselves please enquire about additional costs. Trail Adventures transport schedules are a guide and we will try to adhere to them, but may vary dependant on circumstances beyond our control. Please do not book any onward travel with time dependent connections at the start or end of your tour until we have confirmed your A2O booking. There is a bike transport fee for hire bikes including relocation of hire bikes back to their depot of origin. Postpone, cancel or delay any aspect of the tour if it is necessary due to poor weather, snow or icy conditions or if conditions are considered to be too hazardous and threaten the safety of the participants or Trail Adventures staff. It is Trail Adventures policy to deal with only one person organising a group (2+ people). Where possible it would be appreciated if one payment is made per group, but where this is not possible a unique booking reference will be provided for all internet payments so they can be easily collated. Where numbers for the tour fall below 5, the transport to/from the airport may be booked with another transport provider, at Trail Adventures discretion. A If cancellation occurs at least 3 months prior to departure, a 50% refund of the deposit will be reimbursed. B If cancellation occurs 30-90 days prior to departure you will forfeit your deposit in full. C If cancellation occurs between 14 – 30 days prior to your departure date, a cancellation fee of 25% of your total tour price per person will apply. D If cancellation occurs within 14 days of your travel departure date, 100% of the total price will apply, i.e. no refund will be given. It is Trail Adventures policy to review this on a case-by-case basis. The client will be reimbursed any amount owing after the cancellation fee has been deducted from any money already paid to Trail Adventures. Trail Adventures will endeavour to accommodate any requests to change tour dates where possible. If you need to do this you will need to request this via email, with requested dates/tour changes. If your notice is received more than 30 days prior to your original departure a $100 per person transfer fee will apply. If your notice is received between 15-30 days of your departure date, 20% of your total booked tour price will be forfeited and the remainder transferred to the departure date nominated by you. If your notice is received within 14 days of your departure date you will be unable to transfer and must forfeit the booking and rebook to another tour. You will only be able to transfer onto another tour departing within six months of your original tour. From the date of confirmation of your booking you will be allowed ONE variation or amendment to your itinerary after which any variations or amendments to your booking requested by your group, for any reason, shall incur a fee of $50 payable at the time such variation is requested. Please note point 18 about travel insurance below. Trail Adventures covers the following in their self-guided tours: travel to/from airport, some meals (as per quote), accommodation, luggage transfer, cycle hire, emergency bike breakdown assistance, daily contact via phone or in some cases in person. Trail Adventures does not include a guide to travel with you at all times on the self-guided tour. If additional transport is required over and above transport to or from airports, a fee will be incurred. Where possible, if transport is required due to bad weather, illness, injury etc, if the person can be transported at the same time as the usual daily luggage transfer, there may be no additional charge. Please note however that luggage transfers occur at a time to suit the other business activities and may not coincide with motel check-out times for guests. A fare-paying shuttle service is available for clients wishing to visit other points of interest during their tour. Supply of bike, pannier, helmet, repair kit and pump are all inclusive in the bike hire charges. A The client is responsible for any damage that occurs to the supplied equipment and also for any costs to undertake its repair. B The equipment will be checked at the time of hire and any existing damage will be noted accordingly. C The equipment will be treated with respect at all times and the client will make no alterations to the equipment other than for ‘comfort reasons’. D Cycle helmet must be worn at all times on NZ roads and the cyclist must keep to the left side of the road at all times. E The client acknowledges that Trail Adventures shall in No Way be held accountable for any incidents or accidents should they occur. Payment of your deposit to Trail Adventures, directly or through your travel agent, shall constitute a warranty by you that you, and any other persons covered by your booking, are sufficiently fit and healthy to undertake the relevant tour or other travel arrangements. As part of this warranty, you agree to indemnify Trail Adventures for any actions, claims and demands arising out of any health issues arising on or after the completion of your tour or other travel arrangements. To fully enjoy and make the most of your tour, we advise you to prepare yourself for the cycling you will experience on the tour. 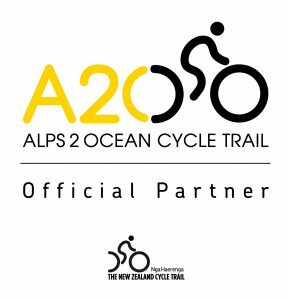 It is highly recommended that you are familiar with the A2O cycle trail and its varying track conditions and fitness/skill level requirements. See www.alps2ocean.com. It is also a very good idea to keep any eye on the up to date information on this website before and during your cycling journey. If your cycle tour is for a number of days, ensure your fitness levels can sustain this exercise for a number of days. If you have a medical condition you must disclose this upon booking. A rider checklist will be sent to you at the time of booking for you to complete and return with your final payment. If after your booking is confirmed you begin to suffer a relevant medical condition you must update us at least 14 days prior to departure. Trail Adventures strongly recommends that all customers, including domestic travellers, take out full travel insurance which covers them for the entire period of their tour. Late payment – Trail Adventures may, at its sole discretion, charge an additional fee of up to $50 per booking with respect to any late payment of any fees payable by you to Trail Adventures to cover additional processing costs. Trail Adventures asks you to keep luggage weight to specified requirements due to Health and Safety considerations to our staff. Included in your quote is allowance for the transport of one gear bag or suitcase. Individual bags are not to exceed 15kgs each. When transferring luggage, some bags need to be carried large distances, through doors, corridors and over or around obstacles. Accordingly any bags over the 15kg limit will not be carried. Additional bags can be transferred between accommodation providers for an additional fee of $15/bag/day. We do understand that some of you will have large suitcases as part of an extended holiday. To cater for this Trail Adventures offer a service where extra bags can be moved directly to the end of the trail and stored for you. A one-off fee of $15/bag is payable. Please feel free to get in touch if you would like us to add this service to your itinerary. Travel insurance is not included in the price of your booking but it is strongly recommended and provides protection against most legitimate reasons for cancellation. Talk to your travel agent or insurance provider about travel insurance. This recommendation also applies to NZ domestic travellers. Any risks or other aspects of any tour or other travel arrangement notified to you by or on behalf of Trail Adventures, in these terms or otherwise. Any change to your itinerary or delays in departure or arrival times of aircraft or otherwise during the conduct of any tour or other travel arrangement. Any loss or damage to your luggage. Any loss or damage to vehicles or valuables stored with us. We will take all care to ensure `that any vehicle/s stored with us is not only secure but that it is well looked after, however we take no responsibility. Any personal injury or death resulting from the acts or omissions or negligence of any third parties providing goods or services to you during your tour or other travel arrangements including without limitation; air carriers, hotels, restaurateurs, transportation providers and/or medical personnel. Any loss of enjoyment by you due to circumstances outlined in these Terms or otherwise beyond Trail Adventures control. Total liability: Not withstanding any other provision of these terms, and to the maximum extent permitted by law, Trail Adventures maximum liability to you or any third party, including any claims of negligence on the part of Trail Adventures, is limited to the amounts actually paid by you with respect to your booking, excluding insurance premiums, variation fees and additional fees, as applicable. Consequential loss: Trail Adventures will not be liable for any loss of enjoyment, opportunity, profit, savings, revenue or interest or any other consequential or indirect, incidental, special or punitive loss, damage or expenses even if Trail Adventures has been advised of their possible existence and even if such loss, damage or expense is caused by Trail Adventures negligence. Indemnity: You agree to indemnify Trail Adventures for any loss or damage suffered by Trail Adventures as a result of, or in connection with, any breach of these terms or any negligence or wilful default by you or any other person covered by your booking. Force Majeure: Trail Adventures shall not be liable for any delay or for any failure to fulfil its obligations under these terms, or any service obligations to you, if the failure or delay arises directly or indirectly from or as a consequence of any Force Majeure event. Accident Compensation Scheme: You acknowledge that New Zealand has a no fault law and claims are handled by the Accident Compensation Corporation (“ACC”) pursuant to governing legislation, including the Accident Compensation Act 2001. Because of the wide range of help available from ACC after an injury, you can’t sue for personal injury in New Zealand, except for exemplary damages. Should you require additional cover outside that provided by ACC, then you should organise your own cover direct. Trail Adventures is not obliged to take out any such additional cover on your behalf. These terms may be subject to amendment by Trail Adventures from time to time. You shall not assign or purport to assign, whether in whole or in part, any of your rights or interests under these terms or any booking with Trail Adventures without the prior written consent of Trail Adventures. The failure of Trail Adventures to enforce any provision of these terms shall not be treated as a waiver of that provision, nor shall it affect Trail Adventures future right to enforce that provision. Additional terms and conditions may apply to your booking and will be advised by your Trail Adventures representative at the time of booking or variation thereof. All prices specified in any itineraries are gross amounts and, unless agreed by Trail Adventures, no itemised costing will be provided. If a dispute arises between you and Trail Adventures in connection with any booking and/or these terms, the parties undertake in good faith to use all reasonable endeavours to settle the dispute by way of good faith negotiations. If any provision of these terms is, or becomes, unenforceable, illegal or invalid for any reason it shall be deemed to be severed from these terms without affecting the validity of the remainder of the terms and shall not affect the enforceability, legality or application of any other provision of these terms. The information supplied by you on the booking form will only be used by Trail Adventures Ltd. However, in the unlikely event of an accident, any special medical or personal information may be supplied to medical or emergency services personnel. Your contact email/information will be used only for our purposes to send you information on your booked products and for future newsletters we may send. You will be able to cancel the newsletters if you wish by contacting us. You authorise Trail Adventures to contact any source or to provide your contact details in order to check, exchange or provide information relating to you for the purpose of providing services to you. Trail Adventures will only use the personal information you provide or it obtains from other sources in connection with the provision of services to you. You may request, at any time, to have access to the personal information held by Trail Adventures about you and to request correction of that personal information. These terms constitute the entire agreement between the parties about its subject matter and any previous agreements, understandings and negotiations on that subject matter has no effect. These terms are governed by the laws of New Zealand and the parties submit to the nonexclusive jurisdiction of the New Zealand courts. Additional fees means the fees specified in clause 16. Force Majeure event means any act of God, war, terrorism, fire, flood or any other extreme weather conditions, loss of power, epidemics or pandemics, industrial disputes, slow-downs or other strike activities, riots or civil disturbances, acts of government, semi government or other authorities, inability to obtain any necessary license or consent and delays caused by subcontractors, suppliers or third parties, including telecommunication carriers, material shortages or other disruption to any tour or other travel arrangements. GST means as applicable, any goods and services or value added tax in terms of the Goods and Services Tax Act 1985 (New Zealand), at the rate prevailing from time to time and includes any reassessment thereof. Other travel arrangements mean any travel plans not defined as a “tour” in respect of which Trail Adventures have provided services, for example, any independent holiday, transport or vehicle hire. Price means the price quoted by Trail Adventures for any tour or other travel arrangement, or amendment thereof, in the relevant booking confirmation, or amendment thereof. Terms means these terms and conditions and, for the avoidance of doubt, includes any additional terms and conditions relating to your bookings as advised by your booking agent at the time of booking. Tour means your cycle trip itinerary as organised by Trail Adventures. Travel departure date means, in respect of any tour or other travel arrangement, the first date in which pre-booked arrangements made by Trail Adventures commence. Variation fee means the fee payable in accordance with clause12.